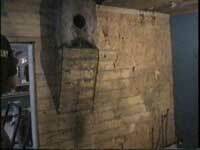 Restoration requires removing the most recent renovations in a building. In most rooms, including this small kitchen on the second floor, several layers of wall and ceiling covering had to be removed to get to the period layer of the restoration. LEAP students remove layers of beaverboard and wallpaper from the walls and ceiling. Some of the wallpaper had been pasted over flattened cardboard boxes. 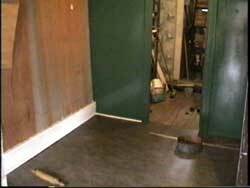 The walls were stripped down to the original wallcovering of beadboard. There is also a chimney in the kitchen for a small wood/coal burning stove for cooking and heating. 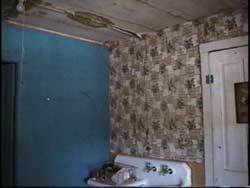 The walls were covered with paneling, backside out, because the walls were too rough to wallpaper. The back wall was repainted to an original dark green, covering the bright blue color used in the 50s. The kitchen was then wallpapered, ceiling and walls, by two board members. This small kitchen served the three apartments that were on the second story. There is also a bathroom behind the kitchen which has not been restored and is currently the only space to store tools and supplies. Indoor plumbing did not come to the old hotel until 1946.